How does time relate to our worship and prayer both corporately and privately? Fr. Thomas tells us how the Church looks at time. Fr. Thomas looks at the significance of using leavened bread and real wine for the Eucharist. In the second installation of his new series, Fr. 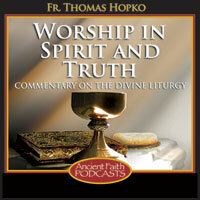 Tom Hopko talks about the biblical and evangelical nature of the Divine Liturgy. True worship in Christ and the Holy Spirit. In this important episode, Fr. Thomas shows how the Passover Exodus pre-figures the work of Christ and how that relates to our worship today. We continue now with our commentary on the Divine Liturgy of the Orthodox Church, and today we would like to comment and reflect on the relationship of the Divine Liturgy, the eucharistic Liturgy, to time, to the time of day, the time of week, the time of the year, various seasons. How does the eucharistic Divine Liturgy—and here, very particularly, the Liturgies of St. John Chrysostom and St. Basil the Great—how do these Liturgies relate to time? The first thing that we would want to say, which is very, very important, is the following. The Divine Liturgy is not a service that has a particular time of day. It’s actually served at different times of day. But we want to make clear that it is not a morning service or an evening service or a noonday service as such. It doesn’t belong to what you could call the Liturgy of Time in the sense of a time of day. I will mention in a minute the different times of day when the Liturgy is prescribed to be celebrated according to the Orthodox Typikon. The word “typikon” means a kind of rule of prayer, a regulation. In Slavic it would be called “ustav.” How do you follow the Ustav? how do you follow the Typikon in doing things the way the Church prescribes? And we’ll see that there are prescriptions on various particular days at what time of day the eucharistic Divine Liturgy should be served. But what we want to see right from the beginning is that it is not a service that belongs to a particular time of day. It’s celebrated at different times of day. There are services for the times of day, and here this follows the Old Testamental practice, the law of Moses, certainly what we find in the psalms, for example, when we sing in the psalms, and basically in the Orthodox Church and in general in the churches of Catholic tradition, there developed a practice, particularly in monasteries, of having a liturgical service. This meant a service of the Church itself, not a private prayer meeting, not a private devotion, but there were times of day when a particular church community as Church—as they say qua Ecclesia, as the Church—where the church itself would gather and consecrate time, consecrate the times, various times and hours of the day. Now, the liturgical offices for the times: There are seven times in the day when the Orthodox Church as a church, for example, in parishes or certainly, first of all, in fact, in monasteries, where times of day are set aside when there are supposed to be particular liturgical, ecclesial services, gatherings of the community, or at least gatherings of the community where anyone who is free to attend may attend, and those who are appointed to attend would attend, but they are services open to the public. What we will see is that every liturgical service of the Orthodox Church must be a service open to all the members of the Church. Except for the second half of the Divine Liturgy, which we’ll speak about later, these services are generally public services. Anybody can come to them: baptized people, unbaptized people, catechumens, seekers, curious people. Anyone would be welcome to come to an Orthodox liturgical service if they are willing to behave themselves, of course. If they come and act in an appropriate manner and don’t make any trouble and be quiet and observe the prayer of the Church as such, they certainly would be welcome. The doors would be open; the doors would not be shut. Some places that I know of, for examples some on Mount Athos, they do not let non-Orthodox people go into the nave of the catholicon of the church building for a liturgical service, that they stand in the narthex. I think, I was told, anyway, by one monastery that has this practice, that they only do it for practical reasons of good order, and not for any particular lofty theological reason, because sometimes people would come, they would walk around, they would talk, they would kiss icons or whatever, while the liturgical office was going on. So they simply made a rule that those who were there as pilgrims who came to pray would be in the nave of the church building, and the other people should stand in the back or stand outside and generally be quiet and give respect to the liturgical service that was being served. But normally, we can say, these services are not exclusive. Nobody is excluded if they’re willing to behave themselves and come in and they want to listen, they want to hear the psalms, they want to hear the hymns, they want to hear the prayers, they want to participate. They may pray, they may not pray, but generally they’re welcome. Now, certainly the believers are there in order to consecrate that particular time of day, and the monks in monasteries, and nuns, they’re there to consecrate those times of day. What are those times and why are there seven? Well, there are seven because it seems that that just works out very well in how a 24-hour period of the day is, but you also have a kind of biblical references. For example, in Psalm 118:19, the great long psalm about the law of God, the statutes of God, where there are 12 different titles for God’s word—word, statute, precept, ordinance, testimony… It’s a psalm meditating the word of God, and that’s why it’s read on Great and Holy Saturday Matins, because Christ, the Word of God, is lying dead, and he is revealing the word of God, he is the word of God, he speaks the word of God. And then the biblical teaching was that those who keep the commandments of God and do his statutes, they literally cannot die. We all die because we sin; Christ could not stay dead because he had done no sin. The Holy One cannot see corruption. But in any case, in that long psalm, you have a line, the 164th verse of this very long psalm, the longest in the Bible—its 176th verse is long, and it’s all read over the tomb of Christ on the Matins of Great and Holy Saturday—it says this. I rejoice at thy word like one who finds great spoil. I hate and abhor falsehood, but I love thy law. Seven times a day I praise thee, for thy righteous ordinances. So you have that sentence: “Seven times a day I praise thee for thy righteous ordinances.” You also have in the psalter the pointing-out in the evening and the morning. Every vespers in the Orthodox Church office, we sing the psalm 141, which says, “Lord, I call upon you; hear me. Hear me, O Lord. Let my prayer arise in your sight as incense, and let the lifting of my hands be an evening sacrifice.” So there’s an evening sacrifice. Then you have the morning sacrifice. For example, the six psalms at matins all mention prayer in the morning. For example, one of them—I’ll just quote one of them, which says: “O God, thou art my God. I seek thee; my soul thirsts for thee. My flesh faints for thee like in a dry and weary land.” But actually what it really says, I mean, literally says is: “O Lord, thou art my Lord. Early in the morning do I seek thee. My soul thirsts for thee; my flesh faints for thee.” So it refers specifically to the morning. And you have these other morning psalms that are matins and that are at the first hour, early in the morning, where it says, “I lie down and sleep and I wake again, for the Lord sustains me,” and we come to God in the morning. So you also have, not only morning and evening, but you have noonday. For example, if you have the psalm that says, “I call upon God and the Lord will save me. Evening and morning and at noonday I utter my complaint and moan, and he will hear my voice.” That’s Psalm 55, and those words from that psalm are actually in a vesper prayer when the priest would make an entrance into the sanctuary, taking the incense or burning incense before singing the evening hymn with the lighting of the lamps: “O gladsome light of the holy glory of the immortal Father, the heavenly, holy, immortal Father,” the light of the Father being Jesus Christ. And the prayer says, “And in the evening and at morning and at noonday, I praise thee, I bless thee, I worship thee.” So you have these times of day pointed out. In the Orthodox Church liturgical offices, these seven offices of the Church praying as Church—not just private individuals, but the Church praying as Church—begin in the evening. The day liturgically begins in the evening, at vespers, at the setting of the sun, and that’s because in the Genesis, when you have the creation stories, the six days of creation, then the seventh day, it always says the night begins: “It was evening and morning, one day. It was evening and morning, a second day.” So the day begins in the evening, not in the morning. In church the day begins in the evening. So any liturgical day begins with the setting of the sun on the previous day. For example, the celebration of the birth of Christ on Christmas begins at the setting of the sun on December 24, Christmas Eve, and then it takes you into Christmas. So you have vespers, then there’s a second service called apodeipnon in Greek, povecheriye in Slavonic, which means the service after dinner. So what you would have in a monastery, if it was done according to the Typikon, you would have the evening service, then the monks would eat something, then they would come back and have compline. Could be a small compline; could be a great compline. There’s also small vespers; there are solemn great vespers. So there are different forms, but you have the evening service, and then you have the so-called “after-dinner” service, which we call in English, using the Western terminology, normally we call it compline. Small compline; great compline. But that word literally means “after dinner,” so theoretically it should be served after dinner, after you eat. And at the end of that service, you have prayers for going to sleep. So you say the prayer, and then you say the prayer to the holy Theotokos, you say the prayer to the Lord Jesus, and you leave and you go to sleep. At least the monks theoretically would. Then they would get up, in the middle of the night sometime. They may even have an office called mesonyktikon, the midnight or nocturne office, that actually begins the long vigil of the night which is called, generally, orthros. It begins with the midnight and ends in the morning with lauds, to use the Western expression, the praises. So you have a long vigil service through the night, and that would be the third service of the hour, orthros, which very often is called matins in English, using again the Latin word. Orthros in Greek, matins in Latin and English. And this would be a long kind of a vigil service, and it would even have various parts. It would begin in the dark; it would end in the light. It ends with the last three psalms of the psalter praising the whole of creation, and then you say, “Glory to you, O God, who has shone us the light!” because light is God’s command on the earth; it’s the command for us to get up and pray. And then you have it ending with the doxology—on regular days, the small doxology; on great festal days, the great doxology—and then that’s how that service works. So you have that particular service. And sometimes they’re even called by, like I said, by their parts. It could be called “midnight,” it could be called “lauds,” but basically it’s one long service, and it’s the third one. So that’s three. And then you have four more. You have the first hour, called in Latin prime. Then you have the third hour, called in Latin terce. Then you have the sixth hour, called in Latin sext. And then you have the ninth hour, called in Latin nones. So you have first hour, third hour, sixth hour, ninth hour, and those hours, the first hour is at the end of the long night vigil, matins, after you have the praises and the doxology. There could be a break, or it can just continue on to say the early morning office, the first hour. And these, of course, being called first, third, sixth, and ninth, that’s biblical. For example, Jesus meets the Samaritan woman at the well to talk about worship in spirit in truth. It says in Scripture it was about the sixth hour. It meant noon. Also it says in the Scriptures about when Christ was crucified. It’s very interesting, by the way, because Matthew and Luke and John say that the crucifixion began at the sixth hour and ran to the ninth hour, where Mark actually says it began at the third hour. But they used those expressions. So third hour would be around nine o’clock in the morning, and that was the time when the Holy Spirit descended upon the apostles, at the third hour. So even the prayer of the third hour would be: “O Lord, who at the third hour sent your Holy Spirit upon the apostles…” And we’ll see that that’s going to be used in some Orthodox churches at the Divine Liturgy, at the consecration of the Holy Gifts of the bread and wine. We’ll talk about that later. Then you have the sixth hour, which would be noon; the ninth hour, which would be about three o’clock in the afternoon, and these are all somehow connected to the saving events. For example, the ninth hour, it’s simply connected to Jesus hanging on the cross, the sixth hour to his being betrayed. So you have the ninth hour. And then sometimes, in some churches, when there’s no Divine Liturgy being served, the ninth hour would end with what is called a Typika, in Slavonic an Obednitsa, where you take the prayers from the Liturgy of the Word of the Divine Liturgy: you say the Creed, you might hear the epistle and the gospel of the day when there is no Divine Liturgy being celebrated. And then that would be the end of the day, and then the ninth hour would be the end of the day. And then it says it accepts this prayer at this particular hour. So you have those prayers, and those are liturgical offices. Of course, if people can’t go to church, believers can’t go to church, they can say these same prayers at the hours of the day. They can pray in the evening, at morning, and at noonday. They can even pray seven times a day. And there was even a pious practice among Orthodox Christians where a person who would be particularly churchly could even say those prayers of those hours at home or at work or taking a break of their day in the field. They could say those psalms and say the prayer of the hour in order to redeem the time, to sanctify the time. And it became a practice also that if people could not memorize the hours or memorize any psalms or prayers, that they would say the Lord’s prayer seven times. And here, I think, there is a practice of piety in Orthodoxy, that to consecrate the seven times a day, you can say the Lord’s prayer seven times a day. Just say the Lord’s prayer. Maybe say the Creed at one point also, at the compline, for example, the Creed is used; at Typika the Creed is used, to remember that we’re baptized. The individual Christian or the family can certainly consecrate the seven times, but what we want to see is that the Church does it as Church in these seven liturgical offices. Now, what we have to also notice&dash;and this is not part of our series now on the Divine Liturgy, so we will not go into these services in any detail at all, but what we have to notice today, and this is our point—is that the Divine Liturgy is not part of those seven. The Divine Liturgy does not belong to a prayer of a particular hour of the day. It can move around. It’s normally served after matins, or even after the third hour, actually, but not always necessary, and we’ll talk about that in a second. But what we want to say right now, from the beginning, is: the Divine Liturgy is not a prayer service that belongs to any particular time of the day. I always like to think that the Divine Liturgy relates to the prayers of the liturgical times very much like the Feast of Pascha, the Resurrection of Christ, relates to the Twelve Feasts. You know, there are twelve liturgical Feasts of the Church during the Church year, which we will talk about in due time, but Pascha is not one of them; Easter, the Resurrection of Christ, is not one of them. It’s the Feast of Feasts. So you can say the same thing about the Divine Liturgy. It’s not one of the daily offices that have to do with a particular time of day, but it’s kind of the liturgy of liturgies. It’s the celebration of celebrations. It takes us outside time into the realm of the kingdom of God beyond time. It recapitulates all of time in the Liturgy, as we will see, from creation to redemption to the age to come. That’s what the Divine Liturgy does, particularly the Liturgy of the Faithful at the Divine Liturgy; it brings us into a reality beyond space and time. We will certainly comment on that as we move through the Liturgy. So it is not connected to a particular time of day. But here I want to make a personal comment, and I ask your forgiveness and God’s forgiveness for saying this, but I feel constrained and compelled to say it. One of the saddest things, I think, that has happened in Orthodoxy in modern time, in most places, is that people don’t pay attention to the hours of the day. They just serve these services when they want to. Even monasteries do that. They could have vespers in the morning sometime, they could have matins at night sometime, they can pile up all the hours and do them right in a row, so you’re praying for the third hour, the sixth hour, the ninth hour, within the same couple of hours in the morning, for example. We somehow have lost the sense, at least in many places, we have lost the sense that it’s important that these services be done at the times when they are prescribed to be served. Vespers is in the evening, matins is through the night, ending the morning. The first hour, is early morning, let’s say six, seven a.m., the third hour is nine a.m., the sixth hour is noon, the ninth hour is three in the afternoon, vespers is in vespers, compline is after the meal. In some monasteries they have compline immediately after vespers. They’ll have vespers and go right into compline. Well, not to judge anybody—God forbid!—but that is certainly not according to the Typikon. That’s absolutely not according to the Typikon. You can’t have a service that’s called apo-deipnon, after-eating, when you haven’t eaten, and you can’t have a service when you’re praying that you’re going to go to sleep in a minute, you’re going to return to your room and your home and go to sleep when in fact you go out and have dinner. So I think that we really ought to ask ourselves the question: Isn’t it time to do these services at the times they are actually prescribed? And of course, in many parishes in Holy Week that is done also. The vesperal Liturgy of the Presanctified, which is vespers—we’ll talk about the Presanctified in a special time—but anyways, vespers is done in the morning. And then the so-called Bridegroom services are done in the evening when in fact they are matins! It’s a service of matins, which could be put much later at night, possibly, because matins can begin at night, that’s okay, as long as it ends in the morning. But I remember as a young fellow, I was on Mt. Athos in 1961, I was 22 years old then, hanging around out there. But, you know, the monks would even stall at the vigil through the night, because if the sun did not come up, they would not say the doxology! Then they would wait for the sun to come and start to shine and then the priest if he was serving, or the chanter if it was a small matins, would say, “Doxa Soi tō deixanti to phōs—Slava Tebe, kto pokazal nam svet—Glory to you who have shown us the light!” because the light was actually coming up. Then they would say the Great Doxology. And they wouldn’t say it if the light hadn’t come up yet and they were still in the dark. The same thing at vespers: they would not sing, “Having come to the setting of the sun, having come to the sun in the western sky,” if in fact the sun was just rising. And I have to honestly say, I find it very difficult as a priest to serve sometimes when vespers, especially when it’s connected to Presanctified Liturgy, is done in the morning, and you’re singing, “O gladsome light of the holy glory, now we have come to the setting of the sun,” and it could be eight o’clock, nine o’clock, or ten o’clock, or eleven o’clock in the morning, and the sun is just rising and we’re already singing about its setting. Well, if I put it in my sharpest manner, I would say this: to lie is a sin, and to lie liturgically is a big sin. You can’t say to God in prayer, “We’ve come to the setting of the sun,” and the sun is just rising. You can’t say to God, “Glory to you who [have] shown us the light,” and you’re in darkness still. We’ve got to be realistic. And I think that the fact that we play and hang so loose with these liturgical offices, that that’s one of the reasons why a lot of people just don’t take the Church seriously. Who trivializes the Church if not the Christians themselves? And don’t we trivialize things when we do services that are supposed to be done at a particular time and do them at another time, sometimes just for convenience? I understand that pastorally you’ve got to do that sometime. I mean, to have a vigil on a feast where you begin the matins shortly after vespers or together with vespers, but you make sure that it’s at least dark outside somehow, because people will miss the service otherwise; they’ll never have a chance to see it. So you can connect vespers with matins. And by the way, a great vigil is a great vespers, a great vespers that goes directly into matins. But when that’s done in a monastery that follows the rule, that service would be going on eight or nine hours through the night, so you run right from vespers into matins, into the Liturgy, but you’ve started it at the setting of the sun and you haven’t finished it until the sun has long risen in the sky! You consecrate the whole darkness, and it’s called the Panikhida, All-Night, Vsenoshchnoye Bdyeniye in Slavonic, an all-night vigil. Sure, monastics do that, but they don’t leave the church between vespers at the Liturgy; they stay there the whole time. It can be shortened for the sake of the faithful. Accommodations have to be made. Certainly we want to do services so you can get the maximal amount of people present. Sometimes even the Divine Liturgy on a feast day may be served with vespers on the evening before so that people could be present, because they can’t come in the morning with matins and after matins because they’re working. So, yes, there are pastoral oikonomia. There is accommodation. We want to save souls. Man is not made for the sabbath; the sabbath is made for man. The Typikon is made for man, not man for the Typikon, so we shouldn’t be what they would call in Russian “typikonshiki,” idolaters of liturgical rules or something; that could be from the devil. Nevertheless, we should try to do things as rightly and correctly and accurately as we can. Here I would just say: if monastic people cannot do the services at the proper times of day and night, who can? Isn’t that the whole point of a monastery—to consecrate time and to serve the services at the proper times in order to have prayer going on through the entire day at the proper times? It seems to me that that’s the purpose of it. So, you know, here endeth my personal opinion on this, but I think it’s more than a personal opinion, because still the Church says vespers means evening, apodeipnon means after dinner, orthros, outrenya, means morning. First hour, third hour, sixth hour, ninth hour means that particular time of day. What we want to see now is that the Divine Liturgy doesn’t belong to any of those times of day. It’s served at different times on different days. If we look at the week, however, and follow the Mosaic Law, the Torah, the day of prayer for God’s people of the Old Covenant was Saturday. It was the Sabbath day, and that was the day that was kept holy, and that was the day when the Jews would keep it holy and they would sing the hymns and say the prayers and hear the Scriptures and do no work. In fact, the very word “sabbath” comes from an Ugaritic word, apparently, that means “do nothing.” It’s a day when you do nothing but celebrate God, and then you would have a meal, even, a special holy meal, a paschal meal, and you would celebrate like a festival day. That’s on a very particular day of the week. For Christians—for Christians—the day of the holy Eucharist of the Divine Liturgy as far as the week is concerned, is not the Sabbath, but it’s Sunday, called in the holy Scripture of the New Testament, “the Day of the Lord, the Kyriakē Ēmera,” and that is the Greek version of the Old Testament word, “Yom Yahweh, the Day of the Lord.” And the day of the Lord was when the Lord appeared and brought his kingdom to the world and when he sat enthroned in glory and when all the world glorified him. For Christians, Sunday, the day after Sabbath, is the day of Christ’s resurrection from the dead. It is the day of the Lord. It is the day of re-creation of creation. It is the day that anticipates the Day without evening in the coming kingdom, and we’ll see how even the prayers of the Divine Liturgy specifically say this, as we get into it. So when you ask the question, “What day of the week is the Divine Liturgy… the Church is required to gather and to celebrate the holy Eucharist?” the answer would be Sunday. And to this day that is the case. Christians celebrate the Divine Liturgy, as a rule, on Sunday. And you even see in the New Testament Scriptures, it said that earliest Christians would meet on the Lord’s day, Sunday, and that they would break the bread. They would hear the Scriptures, they would contemplate the word of God, they would worship God and the risen Christ, and they would be gathered by the Holy Spirit to constitute the Church of Christ, and they would celebrate, to use modern terms, the Divine Liturgy. In other words, they would have the word and they would have the meal, and they would offer themselves to God in sacrifice together with Jesus Christ, and enter with him into the kingdom of God not made by hands in the heavenly Jerusalem, where they had entered already because they were baptized and sealed. We spoke about this already. So what we want to see now, at this particular reflection, is that when it comes to the time of day that the Divine Liturgy would be celebrated, it will differ at different times, and we’re going to say in a minute which times that would be. But normatively, normally, it would always be celebrated on Sunday. In the Orthodox traditional Typikon, rule of prayer, liturgical prayer, the Divine Liturgy is always also celebrated on Saturday. Every single Saturday of the Church year is a day for the celebration of the holy Eucharist. There is no Saturday when it is forbidden to celebrate the holy Eucharist. A kind of an exception would be the Saturday before Easter, before the Pascha of the Lord, where you have a vesperal Divine Liturgy, but still, it’s a Liturgy that begins with vespers, but it’s still done on the eve. It takes us into the holy Pascha, but it doesn’t belong to that Saturday as such, but it’s a kind of Sabbath Liturgy, and you begin by singing, “Today is the blessed Sabbath. This is the day that the Lord consecrated,” and you’d sing all those readings and songs and hymns for Great and Holy Saturday and end with a eucharistic celebration. So Saturday would be a day for the Eucharist, Sunday always a day for the Eucharist, and then there would be other days when the full Divine Liturgy would be served. The other days for sure would be the major feasts of the Orthodox Church. We already said that Pascha is the Feast of feasts. It doesn’t belong to the twelve major, but there are twelve major feasts in the Church year where you always celebrate a Divine Liturgy. And what are those feasts? Well, they’re the feasts of the Lord. So you have the birth of Christ. You have Christ being entered into the temple for the purification of Mary; that could be a Mary feast, a Christ feast. Then you have the baptism of the Lord in the Jordan, for sure. Then you have the Transfiguration of Christ, which is the New Testamental feast of booths, Sukkoth. And of course the Christmas and Epiphany is the New Testamental service of lights from the old covenant. And then you have, of course, the entrance into Jerusalem on Palm Sunday, which inaugurates Holy Week. You have the Divine Liturgy on Great and Holy Thursday, which is done—it’s an evening Liturgy; you fast all the day, and at the end of the day you celebrate a full Divine Liturgy of St. Basil the Great. And then you have the other feasts of the Lord. You have the Exaltation of the Cross. You have the Ascension of Christ into heaven. You have the descent of the Holy Spirit on Pentecost, and Pentecost, of course, was an Old Testamental feast as well. Pascha was an Old Testamental feast as well. And then you have the feasts of the Theotokos. You have the birth of Mary as a great feast day. You have Mary’s entrance to the temple also as a child, as a great feast day. Annunciation, which comes in Great Lent, is a great feast day. Then there are other feast days and festal days in the Church year, of saints. And then even the week itself has particular celebrations on each day. Monday is the angels. Tuesday is John the Baptist. Wednesday is the Cross. Thursday is the holy apostles with St. Nicholas. Friday is again the Cross. Saturday is the blessed Sabbath, where you often also pray for those who are departed. So you have the days of the week with their special meaning. You have then these great feast days. And then you have other feast days, like, for example, St. Nicholas, St. George, Peter and Paul. Then you have other Mary feasts which are not part of the twelve, like the conception of Mary. Generally speaking, it could be said that the Church can gather for the Divine Liturgy on any one of those days. And the Church can gather, but it’s always got to be a gathering of the Church. There can never be a private Divine Liturgy. There can never be a Divine Liturgy behind closed doors. There never can be a Divine Liturgy when any baptized person would not know about it, in secret, or be excluded from it. There never can be a Divine Liturgy for any particular intention. There can’t be a Liturgy for the dead, or a Liturgy for an anniversary, or a Liturgy for—I don’t know—political protest or something. Western Christians do that with the Mass, but that’s forbidden to Eastern Orthodox Christians following the ancient customs and traditions and teachings. You can’t have an intentional Divine Liturgy for any particular intention or purpose, because the Liturgy is always a celebration of the whole Gospel and the whole of the kingdom of God, and it’s always for everyone, on behalf of all and for all. And it’s never for any particular purpose. So it can be served at any time, as long as the Church—it’s announced and the Church can gather. And you can’t have, for example, a Liturgy for—I don’t know—a newly ordained priest to practice. That would be sacrilege. You can’t say, “We’re going to have three Liturgies in a row tomorrow in the church. You can come if you want to, but the Deacon Michael has been ordained to the priesthood, and he needs to practice serving the Liturgy.” That would really not be allowed. It’s got to be a time when really, in all seriousness, you would expect the entire Church to gather, if it could. Now, you never get the entire gathering. There’s always some reason why people can’t be there; they’re sick or whatever. In fact, the formula in St. Basil Liturgy would even say, “Those who are absent for a cause worthy of a blessing.” But a baptized Christian can only miss the gathered Liturgy, the Divine Liturgy, when they’re absent for a cause worthy of a blessing. They can’t just skip it because they don’t want to come or they don’t feel like it. On all days of the holy Fast of Great Lent, except on the Sabbath and the Lord’s day and the holy day of the Annunciation (which always falls during Lent), the Liturgy of the Presanctified is to be celebrated, to be served. The Presanctified Liturgy is not a Divine Liturgy. It’s a penitential vespers that should be served in the evening, after a day of fasting, and you sing the hymns and the penitential hymns of the day at the end of which holy Communion is brought in that has been consecrated on the previous Lord’s day (previous Sunday), or, if Annunciation, let’s say, would come on a Monday, it might be done on the Annunciation. But normally on the previous Sunday you consecrate an extra offering of the lamb, the bread. You intinct it with the consecrated wine, and you keep it, and you have holy Communion in the evening, normally on Wednesdays and Fridays—might be on some other day—but it’s always an evening communion. And it’s done on the evening of the very day. When the Church celebrates vesperal Liturgies… And there are, I believe, four prescribed vesperal Liturgies in our Typikon: the eve of holy Pascha, the eve of Christmas, the eve of Epiphany—and those are St. Basil Liturgies, vesperal Liturgies, after a day of fasting—and then the Annunciation, which is a John Chrysostom Liturgy, when it’s on a weekday of Lent, but it’s celebrated on the day itself, the 25th of March, in the evening. It is not to be done on the eve. Annunciation Liturgy is to be done on the feast of the Annunciation itself when it falls on a weekday during Lent. If it’s on Sunday or Saturday, then it’s just celebrated in normal manner. So you have some times when the full eucharistic Divine Liturgy is connected to vespers after a day fasting: Christmas eve, Epiphany eve, Pascha eve; Great and Holy Thursday it’s done also. Yes, that’s another one I should mention. So there’s those four times with St. Basil, and then the fifth is the Annunciation. In our time, especially in America, the practice has grown up that, because people can’t often come to church in the morning, that on great feast days, like, for example, Ascension day, let’s say, or St. Nicholas day or even, you know, whatever it might be, where you would want to celebrate a Liturgy—maybe a church is called St. Nicholas so you want to gather the church to have a Liturgy on St. Nicholas day—if it’s going to be done in the evening, which it seems to me would be quite possible—nothing terrifically bad about it, although it normally should be after matins—but if it’s going to be done in the evening for pastoral purposes, it has to be done on the eve. Annunciation Liturgy is not done on the eve of the Annunciation. You have to fast all day and have communion at night during Lent, with a full Chrysostom Liturgy. However, if there’s going to be a vesperal Liturgy on any other feast day, then it has to be served on the eve. Why? Because you can’t be fasting through the day when it’s a feast day! Now here there’s a Typikon principle. The greater the feast, the earlier the Eucharist. That’s why Pascha is even done right in the middle of the night and so on. But if there’s a fast day, when you’re going to have Communion at the end of the day after fasting, and there would be those five times that it’s a full Liturgy—Great and Holy Thursday, eve of Pascha, eve of Christmas, eve of Epiphany, and then the Annunciation Liturgy of Chrysostom—then it has to be in the evening of that very day after fasting. But if you’re going to have a vesperal Liturgy for convenience’s sake or pastoral purposes, it should not be on the day of the feast itself, because you cannot spend the feast day fasting. You can’t spend Annunciation fasting; it doesn’t make any sense. So if you’re going to celebrate Annunciation—excuse me: not Annunciation. That would be fasting, because it would be during Lent, but let’s take another example, St. Nicholas day or any other great holy day, Ascension for example. You can’t spend the Ascension day fasting and then have a Liturgy at the night of the Ascension. You have to do it on the day before. And then there should be some type of preparation: vespers, maybe part of matins, to end in the Liturgy on the night before the feast, so that it would be properly celebrated. But in any case, what we can see now—and we will conclude our reflection with this—is that, normally the Divine Liturgies are celebrated after matins in the morning or after the third hour; that’s the normal practice. On all Sundays, that’s the practice; you never violate that on Sunday. It’s after the third hour in the morning. That’s when it’s celebrated. On those five days I just mentioned, it’s done in the evening—and that’s when it is prescribed to be celebrated. And in Great Lent it’s not celebrated at all except on Annunciation, and then again it’s done in the evening. So this is how we understand how the Divine Liturgy relates to time. It is not a service of any particular time, but the Church instructs us at what times to celebrate it. Now, what times are we instructed to celebrate it? Every Lord’s day, every Sabbath day—as long as the Church can gather. It can never be private, can never be secret, can never be intentional. It’s got to be a gathering of the entire church, which would always be done on the Lord’s day. It may not be done every Sabbath day, because you just can’t do it. It may not be done every feast day; you just can’t do it. Certainly it cannot be done even every day when you can have a Liturgy, because you just can’t do it. But normally, on those days it’s done in the morning. And then several times it’s prescribed to be done after a day of fasting in the evening. And then sometimes it’s not prescribed to be done at all, and that would be the normal fasting day during Great Lent, and on those days the Liturgy of the Presanctified Gifts may be celebrated. This is how we understand the relationship of the eucharistic Divine Liturgy to time. It doesn’t belong to time, but there are times when it is prescribed to be celebrated: every Sunday, on the Sabbath, on the feast days; normally in the morning, and five times it is prescribed that it would be done, after a day of fasting, in the evening. And that is how we understand the relationship of the eucharistic Divine Liturgy to the time of day, the time of the week, and the time of the year, the season of the year.